San Francisco-area artist David Best created "The Temple of Time"
San Francisco-area artist David Best's "The Temple of Time" in Coral Springs memorializes the 17 victims of Parkland. It will be burned down in May. NBC 6's Marissa Bagg reports. An artist's temple memorializing the 17 victims of the Marjory Stoneman Douglas High School shooting opened in Coral Springs Thursday and will stand for three months before it's burned to the ground. San Francisco-area artist David Best created "The Temple of Time," which at 1,600 square feet represents the indefinite period it will take for the community to come to grips with the 2018 tragedy. The nearly 40-foot tall structure is an Asian design with a spire roof that has intricate designs cut into it. Best rejected naming it "The Temple of Healing" because he said that is impossible for the victims and their families. Since 2000, he has built such temples worldwide, including at Nevada's Burning Man festival after a protege died in a motorcycle accident, in Northern Ireland for those killed in political strife and in Nepal for the 2015 earthquake victims. Like those structures, the Stoneman Douglas temple will be burned along with whatever mementos, writings and art that mourners leave behind. That ceremony will happen in May. 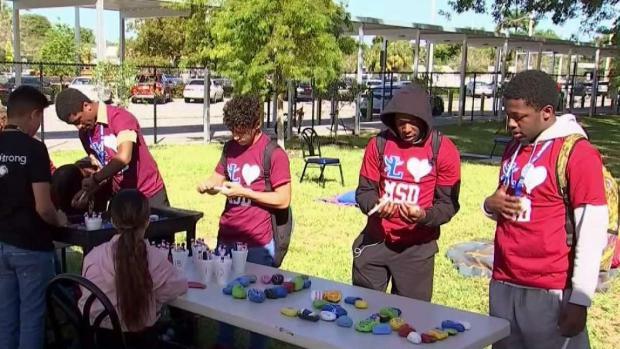 From Fort Lauderdale to Miramar, students across South Florida are taking this day to remember the victims of the Parkland shooting. NBC 6's Nathalia Ortiz reports.